Stonecarver Iain Cotton chiseled and painted the Meridian Stone, and is the first contributor to the project, with a photograph of the stone held in the carver's vice at his studio in Bath, United Kingdom. Homma Meridian on the roof of Street Road. 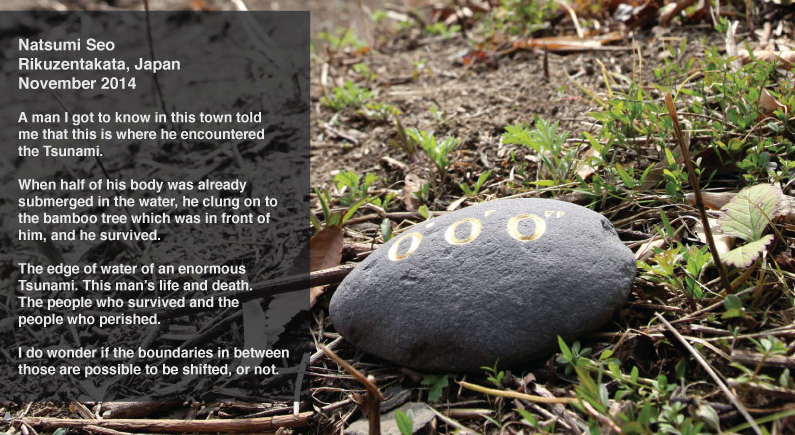 With the Meridian Stone Project, Japanese-born, London-based Kaori Homma investigates our understanding of place and history - both personal and social - and the instances in which the two intersect. This project is an extension of her Homma Meridian, an ongoing work which re-sites the Greenwich Prime Meridian in different locations around the globe, invoking the power-centered nature of demarcated boundaries and space. Homma's Meridian Stone Project is an ongoing collaborative work: a stone taken from Street Road, and carved with the longitudinal coordinates 0º0’0’’ is mailed from artist to artist. The Prime Meridian is set in Greenwich, in the United Kingdom, and indicates where the West begins and the East ends. You are given this transportable version. Place it at a meaningful point. Artists from far corners of the planet respond in both images and words, creating personal meditations on place. As of March 2015 participants include Haruka Komori, Natsumi Seo, and Syo Yoshihama in Japan, Nahyun Park in Korea, Pam Brabants in New Zealand, and Iain Cotton, Ken McLaughlin and Kaori Homma in the UK. These contributions are all featured in the Sailing Stones exhibition. The Meridian Stone will continue traveling and future contributions will be collected - check here and on our blog for updates.